We live in an age where we are able to see, with the help of NASA’s Hubble Telescope and Cassini-Huygens spacecraft, truly amazing images of the far flung regions of our universe on a daily basis. I often think that, as a result, we tend to simply stop looking up in the night sky and wondering at the moon and stars and planets that move above us in plain sight. I know that one of my great pleasures was coming out of my studio to head home through the woods and looking up in the night sky to find those familiar landmarks. Jupiter‘s strong glow as Castor and Pollux look on from a short distance away. The constellation Orion‘s belt and brightest star, Rigel. And of course, the large and calming presence of the moon in all its phases. They become like friends after a while, true and everpresent. Well, when the winter sky isn’t filled with clouds. 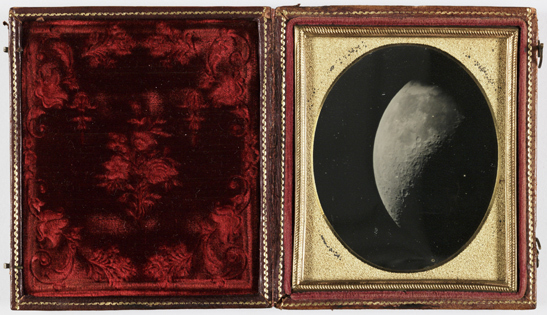 All of this went through my mind in a flash when I came across the early photo shown above, an 1851 daguerreotype of the moon, and this one here on the right, another moon image from 1852, from John Adams Whipple (1822-1891), a Boston area photographer who was a pioneer in early astronomical and night photography. He took some of the earliest photos of the moon and stars using the Harvard 15-inch telescope which was one of the largest in the world at the time. 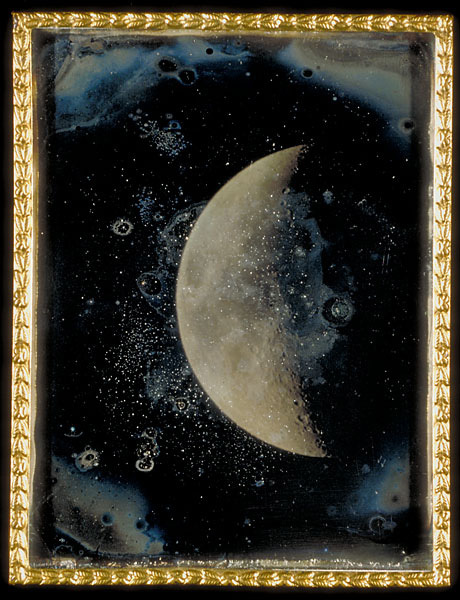 I like the idea that this image in its little precious case was perhaps carried and periodically looked upon a century and a half ago, as one might look upon a photo of a friend or family member. It makes me think that whoever carried this had similar feelings when they looked up into the night sky, a unity with something so much larger than that which is within our reach. A nodding acquaintance with the eternal. Seeing these images from Whipple makes me want to get out and look up into the sky. Hopefully, the clouds will clear and I can see my old friends once more. This is just wonderful. I had a photo of my great-grandmother in one of those cases – now I haven’t a clue what happened to it. Perhaps I gave it to my aunt. In any event, these images are just fabulous. I’ve had a piece titled “Watching the Bright Moon Rise” sitting in my files since 2009, and haven’t been able to do a thing with it, even though I sort of know where it’s going. This would be a perfect header illustration, and the excitement of that may get me going on the story again – one rooted in my time in Liberia. The constellations and heavenly bodies do become friends, don’t they? One of my great regrets about living on the Gulf Coast is that Orion is visible for such a short time during the year, and often so low I can’t see him from home because of Houston’s light pollution. I often wonder how different the sky must have appeared before all the light pollution began to appear. There is a state park not too far from us in rural northern Pennsylvania, Cherry Springs, that is a dark sky park. It has some of the darkest skies on the east coast and on certain nights is so dark that the Milky Way casts a shadow . One of these nights I will have to make my way there.